We are pleased to announce that for the month of May, our friends at Nanaquaket Yoga have so very generously agreed to donate proceeds from their Community Classes to The FLY Foundation. There’s no better way to support FLY while you relax and get your summer beach bod in peak condition! 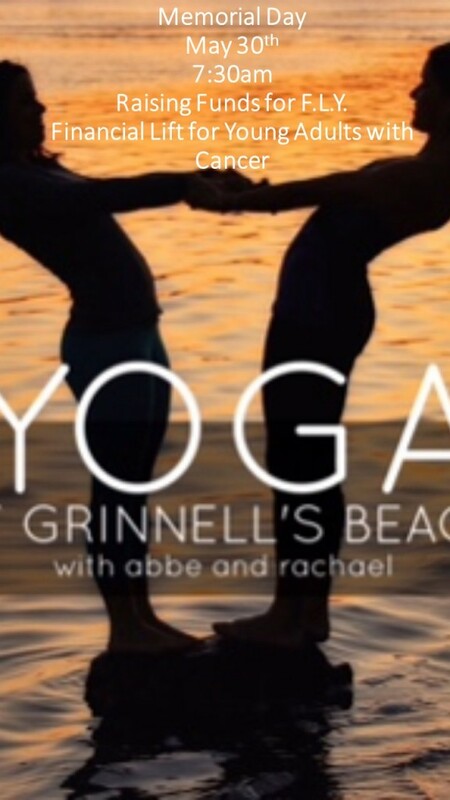 Their offer of support includes their Memorial Day event: Yoga at Grinnell’s Beach on May 30. Nanaquaket Yoga studio is situated in the center of Tiverton, overlooking beautiful Nanaquaket Pond. The facility is located on the second floor of the White Wine Plaza, just above the town’s familiar landmark, Helger’s Ice Cream Shoppe. The entrance is at the rear of the building and parking is plentiful. The studio space is bright and open with amazing sunsets over the pond!